The Travelon Luggage Anti-Theft Cross-Body Bag is becoming an industry standard among travelers due to its security capabilities and stylish variations. The Cross-Body Bag is an excellent example of ingenuity mixed with functionality and a variety of extremely helpful features. When traveling, protection from pickpockets is critical. Therefore, finding a secure bag that you are able to walk around town with is important. Such a bag will allow you to travel stress-free. The Travelon Luggage Anti-Theft Cross-Body Bag comes with many different types of pockets that hold different documentation or items. The main locking compartment includes several internal card pockets as well as card slots. These compartments are large enough to hold passports, credit cards and money. Also, the Travelon Luggage Anti-Theft Cross-Body Bag boasts a smartphone pocket, front zippered pocket and two front pockets that are covered by the flap. 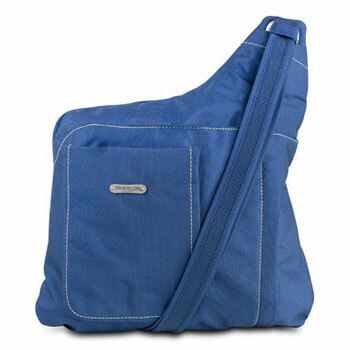 The Travelon Luggage Anti-Theft Cross-Body Bag is not your ordinary travel bag as it comes equipped with so much more. The zipper pulls are constructed from the highest quality materials and are completely tamper-proof. The shoulder strap is completely cut-proof to ensure you the bag is not just slit from right off of your shoulder while walking. The entire body of the bag is completely slash-proof using chain-link construction. When attached to a post of chair, the bag boasts a 25-inch strap length. In addition to the many aforementioned pockets, there is also a rear zip pocket. Finally, the bag features a removable LED light which is not commonly found on any bags. There are many advantages to purchasing this bag. First, it offers the ultimate in security given the anti-cutting technology. This allows you to feel completely secure and worry-free when traveling around town, in crowded tourist areas or on crowded mass transit systems. Second, the materials are of the highest quality so durable was a major consideration during the design of the bag. Third, the number of compartments found within the bag is enough to accommodate even those who travel heavy. Since most of the pockets are hidden, you have access to your items while still keeping them safe from outsiders. The final advantage of purchasing the Travelon Luggage Anti-Theft Cross-Body Bag is, the LED light. This addition to the bag is an excellent feature that is not commonly found within other similar products. The primary drawback to the Travelon Luggage Anti-Theft Cross-Body Bag is price. Given these excellent features and protection, the price is higher than other similar bags. Also, the company features limited color choices. Overall, this is one of the best travel bags available on the market. The cut-proof body and should strap are extremely important as criminals become more intelligent on stealing from innocent tourists. This feature provides the ideal amount of security. Also, given the number of compartments, most of which are hidden, you will have easy access to all documents and money when needed. Additionally, the LED light is an excellent feature for when you are traveling in the dark and need light to see.